The majority of companies have key people who are essential to the success of the business. Whether these people are valuable because of their expertise, power, innovation or information, losing them (even temporarily) could be incredibly detrimental to a company. 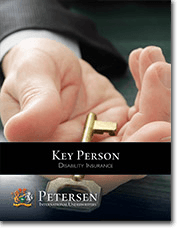 Key Person Disability Insurance provides crucial benefits to protect the company financially in the event that a key employee can no longer work due to a disability. Key Person coverage provides cash flow to help companies move forward and maintain a profit in the event that a key employee becomes disabled. In this situation, high limit disability insurance is invaluable. The company could use the disability benefits to hire a temporary employee should the disabled employee’s prognosis appear to be a short-term disability. In the unfortunate circumstance of a permanent disability, benefits would then be used to help defray the costs related to hiring a replacement employee, such as recruitment, training, startup, loss in revenue and unfunded salary continuation costs. Problem: Over 90% of the traditional carriers do not even offer key person disability insurance in their portfolio. Solution: Key Person Disability Insurance is alive and well at PIU. Problem: Of the few traditional carriers that do offer Key Person Disability Coverage the limits are modest. Solution: PIU offers supplemental key person coverage to amounts of $100,000 per month or more OR $20,000,000 lump sum or more. Problem: Age or Occupation often times knocks down the ability to obtain traditional key person coverage. Solution: Ages as high as 75 and virtually all occupations will be considered by PIU. Key employees typically are those who may have the important clientele relationships, hold the company’s major accounts, or know essential information that is imperative to the functioning of the business. If the key employee is totally and permanently disabled, this information may not be retrievable from the individual, leaving the company struggling to find alternate methods of recovering the information and maintaining relationships with key customers. These additional challenges become very expensive; Key Person Disability Insurance will cover them.